The decision of whether or not to create a home school report card may not be yours to make. But, if you are able to make that decision, such a form can serve several purposes for your child in addition to record keeping. He or she will be able to have a record of his accomplishments to show others. When his friends or church buddies are discussing their grades and passing around cards, he can participate in the experience with others and not feel "left out." S/he may be able to benefit from special awards at local eateries. Check in your area to see which restaurants offer free food or issue game tokens for each "A" earned on report cards. It can be used for your personal homeschool record keeping and become part of a visual, written history of your child's homeschool courses and accomplishments. Typically, on a form like this, you would want to include grades that reflect their scholastic, personal character traits, and any standardized test grades received. You can include a grading key to show the value of an "A" vs. a "B" for example. Letter grades are used almost exclusively in high school grades but are optional for lower grades. Excellent, Satisfactory, Needs Improving, and Unsatisfactory/Poor would be acceptable in these earlier grades and also fine to show progress in character or social skills. It is also common to allow space for comments from the parent-teacher regarding a child's progress and performance in their homeschool curriculum. It is best to focus on the strengths of that particular child here rather than use this as a vehicle to "tear them down." Be truthful but tactful, I say. If a child is performing poorly, this is not the best time or place to alert him/her to that fact. Since you have an opportunity to interact on a daily basis any poor performances resulting in bad grades should have been discussed and hopefully resolved before now. Lastly, an attendance log is usually included covering the current quarter or semester as well as a year-to-date total number of days. We have found it almost impossible to mark a child absent from homeschool. Even if they are unable to complete their regular home school books they are generally well enough to read, listen to a cd or view an educational video or dvd. We have specific resources that we utilize for that purpose, such as our Moody science tapes and Drive Through History dvds. You could also create a playlist and utilize educational YouTube videos. 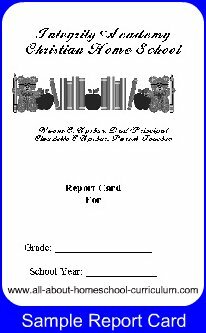 I would like to share a recent copy of a home school report card I created for our family. I like to personalize them and add our school name, Scripture or motto. I print them on cardstock at home and sometimes use pink for the girls and blue for the boys. They enjoy receiving a home school report card and after they show them around, they're filed in their school records along with their other papers. Recently, during a "family meeting" our daughter suggested we establish a Homeschool Honor Roll with awards. We thought it was a really great idea and set it up in our home.